We had the pleasure of working again, at the Cosmopolitan Club along with Ms. Maryanne Scully, a fabulous and consummate professional who just makes life wonderful, not to mention help with keeping the client in a state of bliss. Here are our recent kudos from our last event there. 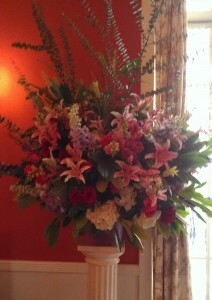 “I wanted to thank you for the most extraordinary floral arrangements you created for our wedding. Carrie and I were stunned and overwhelmed by the beauty of the nosegays you prepared, but when we walked into the ceremony, we gasped at the arrangements. What a beautiful and warm room you created. We are your biggest fans! Thank you for making our wedding such a special event”. Clubs aren’t all the same we have learned and what makes the Cosclub so nice is its old femine elegance. That’s right, “the ladies” rule here – academics, writers, doctors, lawyers…professionals all and more! Always a pleasure to be here and always made to feel at home. For that we thank you all. Cathy and Barry – thanks for this one! This was a wonderful party and the bouquets and corsages were gorgeous – the arrangements in the Dining Room created the perfect atmosphere for the ceremony. I was doing my running around and checking up and remembered – “I’ve got to sweep after the florist” – Nothing to be done. Apart from the total transformation of the room by the abundant floral arrangements, you would not have known you had been there after all that work – thank you! You know, I always love the refreshingly natural aspect of your work, very different form some of the typical arrangements I see, but I know the guests enjoy another bonus. There was an extra arrangement left behind after the Mint Theater evening in the Ballroom and I enjoyed it on my desk for well over a week. It’s always a pleasure when invited to work in your house luv. Thank you for your kind words and look forward to working with you again.